﻿This little yorkshire terrier with the bright black eyes has her own little woven basket, but I reckon she'd like the warmth of the fire instead... so that's where she lays out. 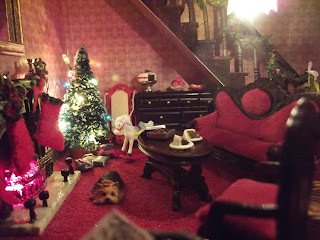 On rearranging the furniture, I placed the doggie further back into the room one day - nearer to the Christmas tree. The next day, the dog was back in front of the fireplace. I thought that perhaps I'd moved her and forgotten about it... Another rearrangement of furniture a few days later, and I put the yorkie on the sofa, as I'd placed the coffee table closer to the fireplace. The following day, little Pookie (as the yorkshire terrier is now known) was squashed into the little gap between the coffee table and the fireplace. I moved the furniture back into the original position, and placed Pookie on the floor, but facing towards the tree. 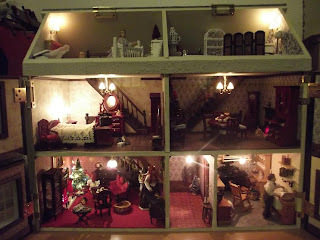 Closing the front of the dolls house, I left the room and didn't return until the following day. I left it as long as possible before opening the dolls house... to find Pookie back in her usual place! I just leave her alone now... that spooky dog. I called downstairs to Hubby and told him that the furniture in my dolls house had been knocked over. "Perhaps the dog did it when it ran up the stairs to the bedroom" he replied. That's the last time Hubby is allowed any where near my craft room after he's been out for a drink with my dad! How stange about the little dog - perhaps you have a spirit who wants to play with your house.